Wow, that sounds like a lot of work. I guess some of the best dishes are. 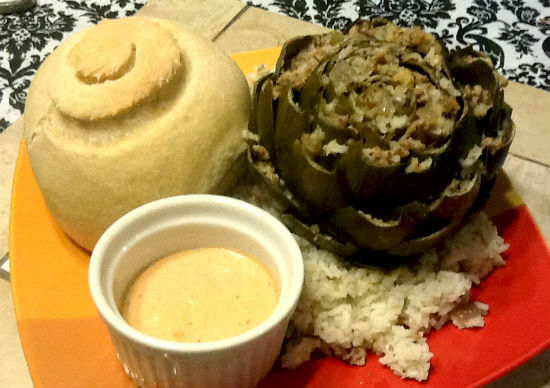 I remember the first time I had artichoke. I was living in Chile and when they served it to me I had no clue what it was because they only told me the Spanish name for it. They served it to me with a lemon butter sauce and I loved it. So I also have very fond memories of my first experience with artichoke. Thanks for sharing this recipe. Thanks for posting! 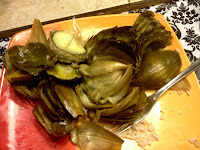 Now you make me wonder what the spanish word for "artichoke" is... And, now, everyone needs to tell us where they were when they first tasted artichoke! Join in! I couldn't remember the Spanish name. Just looked it up and it's alcachofa.